Many years ago, when I was active on online makeup forums, one certain iconic brush would keep popping up time after time, amidst the noise that was MAC brushes. 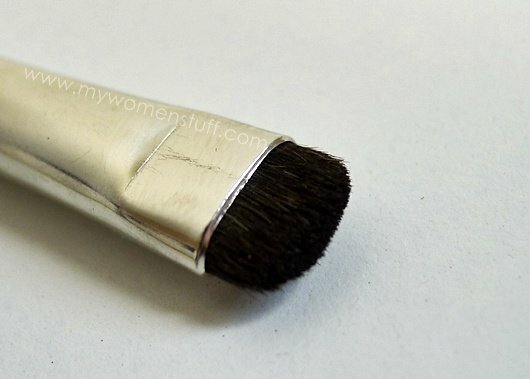 It was the NARS #15 brush also known as the NARS Smudge Brush. Everyone who had it raved over how wonderful it was for doing smokey eye looks and for drawing eyeliner using eyeshadow. I don’t frequent many forums anymore but the memory stayed with me. And one day when a friend asked if I wanted anything from Kissandmakeupny.com I asked to tack on an order for the Nars #15 Smudge Brush. It costs a hefty US$26 but I must say its one of the best US$26 I’ve ever spent. What this brush is, is a brush with short and very dense bristles made of pony hair. Its not scratchy however, and its purpose is for you to “smudge” colour along the lash line. The short bristles allow you to get very close to the lashline which is all sorts of awesome. I’ve been using this brush not for creating smokey eye looks, but more for drawing eyeliner. The dense bristles pick up dark colours easily and I then apply it along the lash line, pushing it between the lashes. This way, I can get the colour even closer to the lashes to give a more subtle look, than if I were to use liquid, gel or pencil liners. I can even use just a dark shadow as liner without having to do my eyes up and it makes my eyes look just a touch more defined, which is of course a good thing 😉 I’ve been trying to get photos to show you, but its too subtle to be caught on camera. As we don’t get Nars Cosmetics here in Malaysia at this point in time, I don’t know if many of you have come across this brush. However, there are many similar ones out there, and I just ordered one from Sigma so once it gets here I’ll let you know how it fares by comparison 🙂 If you do own it, or something similar, pipe up and let us know how you are liking it! Nars No. 15 Smudge Brush retails at US$26. Nars Cosmetics is unavailable in Malaysia at time of writing. i want this one 🙁 i checked the shipping, abit of an ouch and why don’t they have it on strawberrynet. gahhhh! Yup I looked for it on strawberrynet for a long time but it never came up 🙁 Maybe keep in mind the next time anyone makes an order – you know one of us just might one day 😉 Or wait till I get my hands on the Sigma one and see if its the same – that’s cheaper! do let me know if u know anyone placing an order from there 😛 and and cant wait to see the sigma! Thanks for the MAC comparison 🙂 Do the 8 minute makeup and you can sleep in all you want! 😉 I haven’t heard any rumblings of NARS coming into Sephora yet since they aren’t in Singapore either. But there’s always hope 🙂 I tested the foundation in Bangkok where they do have NARS and I’m Mont Blanc. Ended up with Sheet Matte though. I bought a similar brush from Watson’s, under the new range UBU or something Urban. Can’t quite remember the brand name – it’s got the word Urban in it and comes in pink packaging and purple bristles! Anyway it’s also called a smudge brush and works pretty well as liner brush too. Price probably about RM15? I have the LM smudge brush. But i haven’t used it ever since it arrived in the mail.. except gave it its first bath. Haha.. I love NARS smudge brush too… never bought it but heard lots of positive reviews about it. I bought a sigma smudge brush though and it works wornders too..